Does your little monster love everything spooky and scary? Is Halloween their favorite holiday of the year? Sure kids are supposed to be all bright, shiny and wonderful 24/7, but Halloween is a time to transform into something completely different, and something a little dark right? 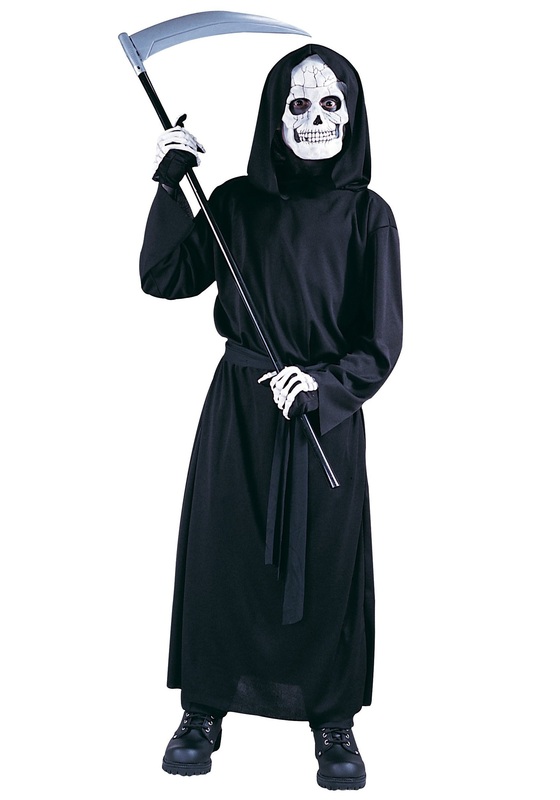 We thought you would say yes, we think our Kids Reaper Costume is a perfect choice for any little goon or goblin. Your little reaper will be all set to spend their night hunting for candy...or maybe for some poor unfortunate souls. Your little one will become an historic dark legend of the night once he or she transforms head to toe into a full on reaper-esque in our 100% polyester full length black robe. The kids will love the frightening latex skeleton mask and the matching black bone gloves. Why not pick up a traditional Grim Reaper sickle accessory while you're here to complete this scary look. Throw on some black shoes or combat boot and you ready to get your reap on! Want to go as a daunting duo this? We've got you covered, we have many options for you to go as a matching reaper or even a skeleton! He or she will be ready to put their powerful dark force into full drive harvest some souls and have frighteningly fun time reaping all the candy this Halloween decked out in our kids reaper costume. It's sure to be grim!